Lake Jean is a 245-acre impoundment located in Ricketts Glen State Park, Luzerne County. The lake has suffered from low pH levels due to acid deposition combined with an infertile underlying geology. The PA Department of Conservation and Natural Resources and the PA Fish and Boat Commission have been applying lime to Lake Jean bi-annually since 1995 in an effort to improve its water quality and fish community. Area 4 biologists surveyed Lake Jean with night electrofishing gear on May 31st and with trap nets during the week of June 4th, 2007. The 2007 night electrofishing catch rate of largemouth bass was 41.5 bass/hour, which was a great improvement from the 2003 catch rate of 21.89 bass/hour. The 2007 trap net catch rates of bluegill, pumpkinseed, and yellow perch decreased from the 2003 work, while the black crappie catch rate increased. These changes in catch rates were likely due to warmer water temperatures encountered during the 2007 sampling. 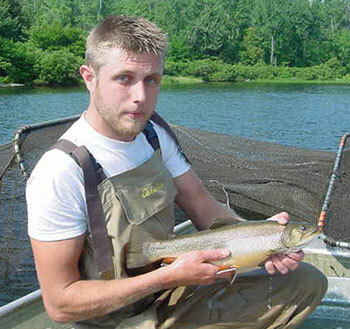 In addition to warmwater species, Lake Jean also receives an annual inseason trout stocking. A number of trout were captured in the trap nets, including some nice sized individuals. In some years, trout can survive in Lake Jean throughout the summer months. Anglers looking for some late-season trout fishing in a picturesque setting could do very well at Lake Jean. Table 1. Fish caught during the 2007 Lake Jean survey.